Empathize, above all, with everyone. Even if you can’t help them in any other way, simply empathize. 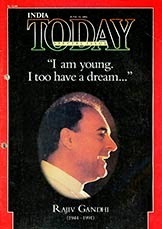 This day, 23 years ago, Rajiv Gandhi, India’s former Prime Minister was assassinated in Sri Perumbudur, near Chennai. I was working as India Today’s state correspondent then. A set of quirky circumstances that evening kept me away from proceeding to Sri Perumbudur, where then Tamil Nadu Congress heavyweight Vazhapadi Ramamurthi had agreed to let me meet Rajiv personally for a quick interview on the party’s poll prospects in the state (India was readying for elections to the Lok Sabha at that time). I heard of the assassination at 10.40 PM through a friend in The Indian Express, who called my landline at home. I called my editor Aroon Purie soon after and he did not make any bones about the fact that I had “blown a perfect first person account” of such a “huge story”. Journalists and media people are pretty much that way – news and story are above all else. Aroon and Rajiv were classmates from The Doon School, Dehradun – and they were also very close friends. But, despite his personal loss, Aroon focused on getting the best coverage of the assassination for India Today. “I want you to salvage the story now. Get me every detail. Why and how did the security lapse happen? Who is responsible for this? What does the local state administration have to say? Get to the bottom of the plot – we must have the most exclusive coverage,” thundered Aroon over the phone, as I took down notes at an STD phone booth on Sardar Patel Road, near IIT, Chennai. (Please note: there were no mobile phones at that time and the landline at my residence did not have direct national dialling facility!). Rioting (by miscreants, in the garb of protesting against the assassination) had begun in the city as I navigated through much of it on my dilapidated Vijay Super scooter gathering information through the night. I had promised to call Aroon every other hour. And I did. On the call, around 3 AM, he told me that he had withdrawn the magazine’s edition (India Today was a fortnightly then) which had gone to print and said the assassination story will now run on the cover. He told me that he had information that Sonia Gandhi was coming to Chennai in a special Indian Air Force (IAF) aircraft with Priyanka to claim Rajiv’s body. “I want you on that plane come what may. Take pictures. I need the most exclusive coverage of this national tragedy in our mazagine,” he instructed me. I didn’t then know where to begin. Get on a plane? Carrying Rajiv Gandhi’s body? With Sonia and Priyanka Gandhi? That too, an IAF plane? I was in my night clothes – pyjamasand kurta – I had no money on me other than a couple of hundred rupees. I headed straight to the Raj Bhavan and met the then Governor, Bhishma Narain Singh. Journalists have both the instincts and the privileges to gate crash anywhere, anytime. I convinced him that he must help me get on that plane. I also got details of all the intelligence reports he had of the assassination. Governor Singh did not promise anything but asked me to show up at the airport at 5 AM. I managed to connect with our staff photographer, Shyam Tekwani, and we both reached the airport and talked our way through the heavy security cordon. Governor Singh, seeing us, talked to a senior IAF official. And much to the surprise – and angst – of other journalists gathered there, on the tarmac at the old Meenambakkam airport, the IAF officer waved to me and Shyam to go onboard. We boarded the plane soon after Sonia and Priyanka did. As I entered the cabin, I noticed Sonia fasten her seat belt. She looked up at me, through the dark glasses she was wearing. I am sure she must have been surprised to see someone in night clothes! But she looked away, lost in her grief. 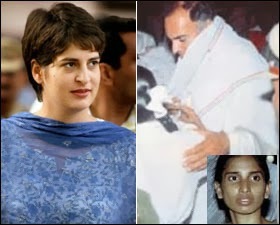 Mid-way through the flight, Shyam peeped through the curtains that separated the area where Sonia and Priyanka were seated, and where Rajiv’s coffin was fastened to the floor of the plane, from our side of the aircraft. There were only three more passengers with us – then Andhra Pradesh Chief Minister Janardhan Reddy, the Gandhi family confidante R.K.Dhawan and an IAF doctor. I peeped over Shyam’s shoulder as he took pictures. Sonia had been sedated (the IAF doctor told me this) but Priyanka was sprawled on Rajiv’s coffin, which was draped in the national flag, and was crying inconsolably. Shyam took many, many pictures. No one stopped him. The tragedy was too big to think of anything else, I guess. When we met in Aroon Purie’s office in Connaught Place, New Delhi, for an edit meeting later that afternoon (May 22nd), we gathered that Sonia had got wind of us being on that plane. She had also been told about Shyam taking all those pictures by R.K.Dhawan. It appeared that she had called Aroon personally and asked him not to publish those pictures or write details of that plane journey. I surmised that those pictures would now not be carried in the magazine. I must admit I was upset. I was hardly 23 then. This was the BIG STORY of my Life. Being on a plane, carrying a former Prime Minister’s assassinated body, where no other journalist in India could even think of being was indeed big. And it now appeared that we were not going to run that story on the Gandhis’ moment of personal grief or carry those exclusive pictures? I cannot claim I truly understood the value of being empathetic immediately, at that moment. But over the years, that perspective shared by Aroon, has helped me empathize better with people in difficult situations. All of us are so caught up with our work, and our worlds, we have no time to pause and think of how others are feeling. About what we are doing to them or about what they are going through. Someone’s gain is always someone’s loss. In some form or the other. And sometimes, it’s difficult to even imagine the grief of someone who has lost something valuable, unless you have been through a similar situation yourself. Learning to empathize with others is however something that can be developed over time and with experience. Words cannot ever express empathy. But actions – a hug, a simple holding of hands, a moment taken to pause and be with that person – can. To be sure, being loving and compassionate takes a lot of doing. But being empathetic just requires being there and making an effort to understand someone’s pain and suffering. Maybe, someone needs your empathy just now? When you want to forgive someone simply forgive. Don’t judge whether the person is worthy or not. What matters is whether you feel forgiveness at your very core. Think about it. When does the context of forgiveness arise? Forgiveness becomes relevant when someone has acted in an irrational, resentful, violent and/or a hurtful way with you. Your hurt is causing you to feel miserable about the episode and you want to see that the person responsible for this is admonished, made accountable or even punished. This is what anyone will normally want done. But as long as the act of reprimand or retribution is not complete you will continue to grieve, you will continue to suffer. In some cases, the person who hurts you may realize her mistake and seek your forgiveness. It’s possible then that you may or may not forgive her. If you choose not to, you will still be carrying the angst of the injury, the hurt in you. But, if in any situation, you choose to forgive, you will be liberated – instantaneously. Priyanka’s effort to reach out, and to be human, in the face of such a traumatic personal loss, is as awakening now as it was then. That she chose to do what she did, without investing to evaluate whether Nalini deserved any forgiveness, if at all, or not, is inspiring. We must remember that when we forgive someone, we let go of all the pent up, wasteful emotions like anger and hatred, within us. We forgive someone for our own sake first. And through our inner cleansing and peace, we help the one we forgive too to move on in Life. Forgiveness frees the person who is forgiving and therefore is not dependent on whether the person receiving it is deserving or not. If you understand this perspective, you will never carry any resentment, any hurt, any suffering in you – ever. And you will be at peace!